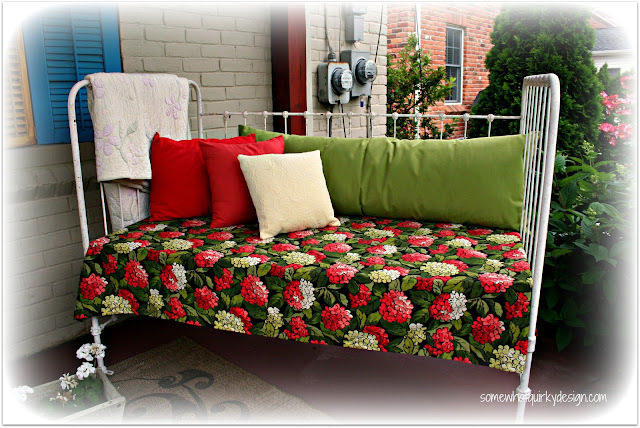 Somewhat Quirky: Is Your Outdoor Seating Ready? Is Your Outdoor Seating Ready? I was thinking that it had been an unproductive blog week. But then I realized I was sort of wrong. A couple of things did happen . . . we'll just talk about one of them today. Hometalk reached out to me to ask if I would curate a board for Affordable Outdoor Seating. I thought that was nice of them - for two reasons. First, because it is just nice. Thanks Hometalk! Second, because I'm right in the middle of getting my outdoor furniture ready for 2013. For some furniture that means bringing up from the basement, touching up peeling paint, putting on an outdoor sealant and cleaning any dirty upholstery. For a few other things it means starting from scratch. Picking out paint, prepping for paint, buying upholstery fabric and making appropriate cushions, etc. Which leads me back to Hometalk. I need some new ideas. I don't want to do just the same old stuff to my old stuff. I want new stuff to do to my old stuff. So I immediately went to Hometalk and did a search for outdoor stuff but it didn't work. So I had to settle for outdoor furniture, outdoor seating, - you know the drill. I'll pause here and say - if you don't know about Hometalk you are missing out. Hometalk is a social platform powered by user generated content, and it is the best place on the internet to discuss your home and DIY projects. It's fueled by the firsthand experience & advice of hundreds of thousands of home and garden lovers and professionals. It lets homeowners and professionals share projects, tips, ideas, questions and answers. Who doesn't need that? You don't have to have a blog or a business to join in. You don't have to have questions of your own - you can just join in and lurk. And who doesn't want to lurk? So while I was curating this wonderful collection of affordable outdoor seating, I came up with a few ideas that you might see on my old stuff soon. But check it out here first! And go to Hometalk - and lurk join in the fun! Way to go Karen! Following you on Hometalk now too! My stuff needs new stuff to put new stuff on. More is broke off the patio furniture than now holds it together. Congrats! Another famous friend!! I do love those green wicker pieces...that was a good choice! I need to check and see if I follow you on HT yet....if not, count me in! 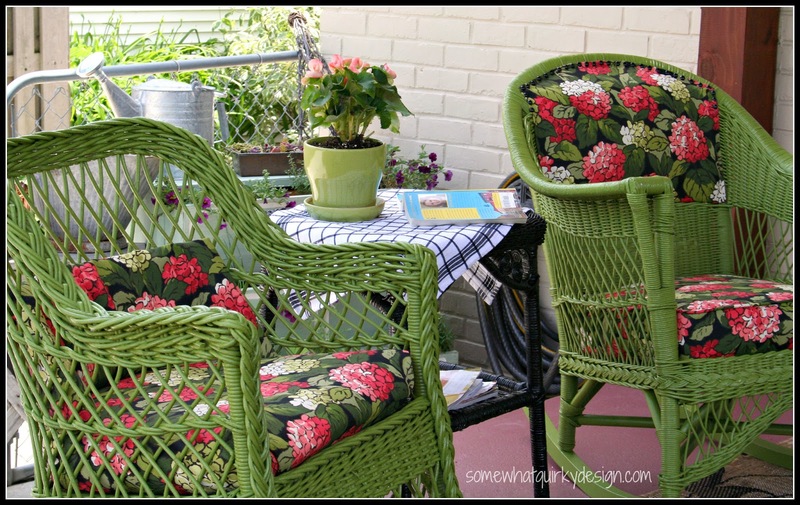 I painted two wicker chairs bright green, too. So cheerful! Congrats on HT. I just joined up and am learning how things work over there! I love your outdoor furniture. I live in a condo and have no outdoor space (besides my back steps), but I'll have some one day. In the meantime I'll live vicariously through you. :) That daybed looks really cool.